Click on the following link to access the NDSU Interactive Sclerotinia Website: https://www.ag.ndsu.edu/sclerotinia/riskmap.html The Sclerotinia Risk in Canola Forecast Program is a service of the Northern Canola Growers Association and NDSU. The Sclerotinia Disease Forecasting System is a regional guide to sclerotinia of canola disease risk. It is meant to be a management tool that canola producers can use in making a decision on the necessity of applying a fungicide to their canola crop for control of sclerotinia stem rot. It is not meant to be a field-specific recommendation for the application of fungicides for the control of sclerotinia. Other factors such as local weather conditions, seeding date, previous cropping history, and yield potential should be considered as well as the risk maps in making the final decision. The forecast maps show regions of North Dakota and Minnesota where environmental conditions are favorable for the germination of sclerotinia sclerotia, development of apothecia and release of spores. The degree of risk is shown as low, moderate and high coded green, yellow and red. By its use, you agree to release the Northern Canola Growers Association and its employees and project collaborators from any and all claims, demands, actions or liability for material used or relied upon by you through this service. All results, statements, technical information or recommendations herein are believed to be reliable, but their accuracy or completeness is not guaranteed. The project collaborator and developer is Dr. Luis del Rio, Plant Pathologist, North Dakota State University. Sponsors are the Northern Canola Growers Association and the National Sclerotinia Initiative. Weather data and technical assistance: North Dakota Agricultural Weather Network NDAWN. 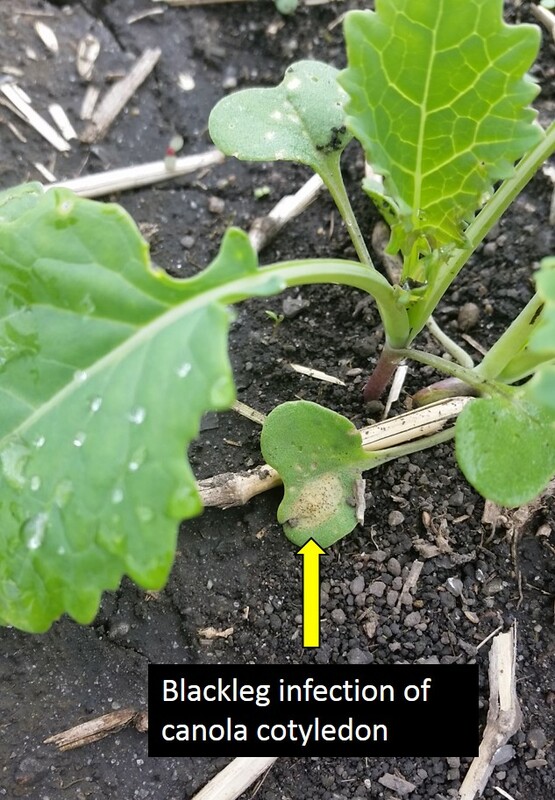 Weather conditions in the previous three weeks were favorable for blackleg infection and now symptoms are visible on cotyledon leaves as well as on the first true leaves of canola seedlings (Figure 1). For additional pictures of blackleg check our gallery. Lesions that develop before the plants reach the 4th leaf stage usually cause significant yield reductions. Thus growers are encouraged to scout their fields for blackleg symptoms. Incidences greater than 20% may warrant a fungicide application. For a list of fungicides registered in North Dakota for use in canola against blackleg please see NDSU extension publication 2016 Fungicide Guide (Canola-Rapeseed). The map of July 31, 2015 applies only to fields that were planted in the second week of June. These fields are at the flowering stage now. Canola fields planted earlier have finished flowering and are at various stages of ripening. The window for Sclerotinia infection for these fields has closed and with it the risk of widespread infection. If warm and dry weather prevail in coming weeks the crops will be safe; however, if heavy rains return to the region Sclerotinia damage may occur in localized areas of fields where heavily lodged canola plants are present. Fungicide applications at this time, however, would neither be recommended nor warranted as the product would not be able to reach the plant parts affected. Weather conditions are favorable for blackleg development Rainy and cool conditions experienced in past several days in the northern half of the state are favorable for blackleg development. Growers are encouraged to scout fields for signs of infection that may include wilting of seedlings and girdling of stems. These symptoms are more likely to appear in fields that had blackleg problems the previous growing season. Fungicide use in such fields may be recommended if plants have not reached the 4th leaf stage. Once plants get older, fungicides will be less effective. in three of them an indication that fungicide applications may be needed to reduce damage by Sclerotinia. Growers in this county should keep in mind, however, that the risk applies only to fields that are at the flowering stage. Fields that have not entered flowering should not be sprayed at this time. Growers in all other areas of the state are encouraged to look for apothecia in their fields before making spraying decisions, especially if their fields are located in areas with intermediate or high risk. Windy days with warm temperatures and no rain are reducing risk of Sclerotinia development Windy days combined with warm temperatures and absence of precipitation has brought down the risk of Sclerotinia development for most areas where canola is grown. Warmer temperatures forecasted for the next several days will help keep the risk low in most areas while speeding up flowering. Recent rains are elevating risk but most fields are out of danger Rain events of the past few days have increased the risk of Sclerotinia development. However, most fields are by now past the full bloom stage and therefore are out of immediate danger. Dry spells like the one experienced during the past two weeks usually reset the carpogenic germination clock and consequently apothecia will not be produced in time to cause problems in fields that have not yet reached the full bloom stage. If rainy weather continues, however, apothecia may develop at a later time and could create some problems in areas where heavy lodging occurs. Unfortunately, fungicide applications in such fields will likely not produce a positive return because the fungicide will not be able to penetrate the canopy to protect the areas closer to the ground. Most canola fields are ending flowering period By this time, most canola fields are ending flowering and starting the ripening stage. Since the window for Sclerotinia infection has closed, the risk of disease development has dissipated as shown in the last map of the 2014 growing season (July 31).